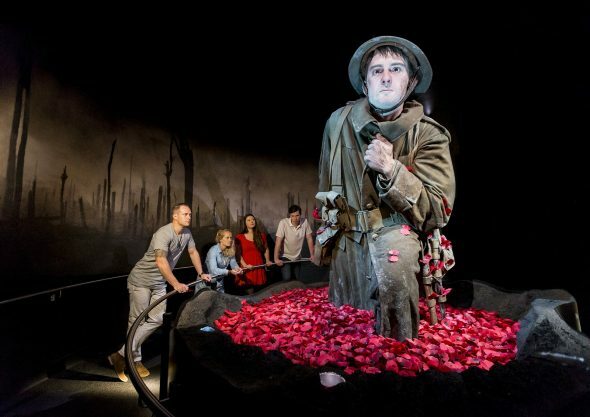 Finding Cecil Malthus in a muddy shell hole at the end of Gallipoli: The scale of our war reminds visitors that many Gallipoli veterans like Cecil went on to face more hardship on the Western Front. Cecil Malthus emerging from poppies on the Somme. Gallipoli: The scale of our war. Te Papa / Weta Workshop. Just over 100 years ago, in September 1916, Cecil fought in the Battle of the Somme – the New Zealanders’ first large-scale action there. In total, 1.2 million Allied soldiers would be killed or wounded over 141 days from July to November – all for a gain of 12 kilometres. In a letter to his sweetheart Hazel Watters, Cecil described his experiences in that action as ‘a taste of hell’. Cecil Malthus was born in Timaru in 1890. He excelled academically and went on to university in Christchurch. In 1912, he was awarded a Master of Arts in French and English. After university, Cecil trained to be a teacher. In 1914, he joined the staff of Nelson College. Cecil Malthus, 1914. Courtesy of the Malthus family. 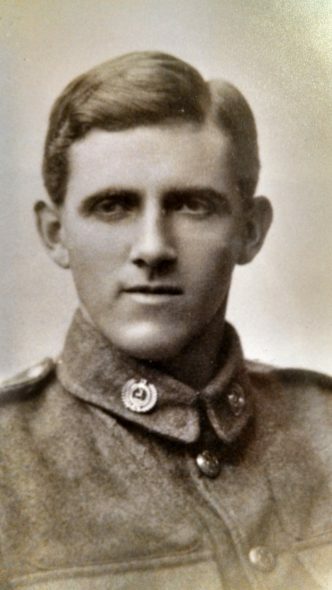 Cecil’s time at the school was cut short, when he (above) volunteered for service 10 days after war was declared and then left with the Main Body in October 1914. A private in the 12th (Nelson) Company of the Canterbury Infantry Battalion (see badge below), he was selected to be a member of the battalion’s seven‑man scout patrol. Cecil landed on Gallipoli on 25 April 1915. His campaign included three stints at Quinn’s Post, one of the most exposed spots on the Anzac front line. He was hospitalised several times due to illness, but was still on the peninsula when troops were withdrawn in December. In April 1916, Cecil went to France. Over four months, the men in the newly formed New Zealand Division occupied a ‘quiet’ part of the war zone – though it was everything but. There, they got a taste of Western Front trench warfare. Initially, the New Zealand Division was stationed near Armentieres (where many men purchased and sent home souvenir handkerchiefs like the one above). There, gas attacks and constant, heavy artillery fire were a fact of life. However, being able to speak French enabled Cecil to befriend locals. During the Battle of Flers-Courcelette, the New Zealanders advanced a creditable 2.3 kilometres They helped secure the gutted town of Flers after the British captured it. The photo above shows the decimated landscape three years later in 1919. Cecil Malthus at Brockenhust Hospital second from left, 1916. Courtesy of the Malthus family. Cecil’s foot was gangrenous by the time he got to a hospital in Rouen. But, because doctors were too busy to amputate it he was sent to a New Zealand military hospital (above) in England, where most of Cecil’s foot was saved – although his missing toes tingled for the rest of his life. In December 1916, Cecil was declared unfit for active service. 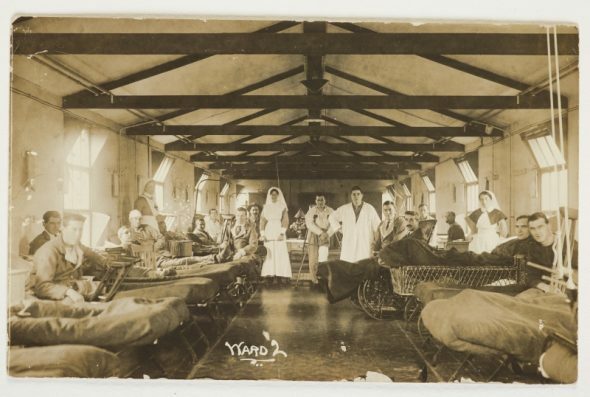 He travelled back on the New Zealand hospital ship Marama (below), arriving in Timaru in March 1917. Cecil and Hazel married in 1918. They lived in France for two years and then Tasmania for a decade, raising five children. The family settled in Christchurch in 1934, when Cecil became Professor of Modern Languages at Canterbury College. Before his death in 1976, Cecil wrote two vivid accounts of his experiences on Gallipoli and the Western Front. The first was dedicated to Hazel; the second to ‘all old cobbers, but especially those who have no memorial’. Many thanks to members of the Malthus family who very kindly enabled and supported us to tell Cecil’s story in Gallipoli: The scale of our war, by sharing their knowledge and confirming details of Cecil’s life and allowing photographs held by the family to be used in the exhibition.